Thank you very much, sorry for the delay but here it’s “Earthquake time”. Luckily there’s no big problem and I’m still writing to you from my studio, but the situation is not so easy. 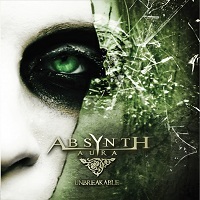 Your first CD Unbreakable was released in October 2011. Congratulations, very good songs! How were the reactions? Are you contented with the feedback? Thank you very much, we like our songs too *hihi*! Reactions were great, a lot of reviews, interviews and so on… we are a new band so we need to speak about ourself to be known. We have to thank our label because they did an incredible job and support us in this 1st step. They were amazing and I think everyone of us feel really great for the attention gave to Absynth Aura. Why did you choose Absynth Aura as band name? You have to ask to Viossy *haha*. We understand to be a band and not just a Klod’s project when we search a name for the band. Everyone of us had some ideas and we were searching for something can give a name to our music, but also nothing too clear so everyone can find a meaning to this name. Absynth Aura was a Viossy’s idea it came from the Absynth fairy you can find in a short scene of the movie „Dracula“ (with Gary Oldman, Wynona Rider... remember?). Aura it’s about something you can’t touch, but you can feel, something important, but untouchable. Could you please introduce the members from Absynth Aura and tell us a bit about the history of the band? Mark is a Hard Rock drummer who fall in love with progressive stuffs, but never forget power and sharpness of true Hard Rock. He had played with a lot of band of his country and he plays with Klod from 2001 (I think...). For a drummer he his extremely melodic so he is a very important opinion when we need to choose some chorus or arrangement. He also very interested in sound both band and drums. You can listen to every single cymbal or splash in this CD thank to his great job. Viossy is the machine! He plays smooth and powerful at the same time. He is my perfect guitar player because he can plays rhythm guitar as a side man than turn on the distortion and become a metal master and when he plays a solo... the audience seem enchanted. He play tons of chords and different harmonies, but it’s cool because if you listen you don’t feel something complex, but something really melodic. If you have an idea he can play it no matter if it’s electric, acoustic, a solo or... whatever you can think! I play with him since 1999 and we love to work (and something fight) together. Who wrote the music and the lyrics – all band members in teamwork? There’s a lot of teamwork. More or less me and Viossy wrote the music, Klod writes melodies and everyone of us write lyrics… but for every single song there’s a different path and everyone of us can say something about all parts from drums to choirs. We work a lot on demo and pre-production to have a clear idea of arrangements and global sound before start to record. Sometime we fight, sometime it’s hard but our teamwork is great and we love it! It’ s a very difficult question… I always write something in my mind before taking an instrument in my hands. I think the instrument could be limit because you do what you know you are not free. So sometimes I start to sing something in my mind and even to arrange it… When the idea seems a song it’s time to sit in my studio and try to record a demo. From this moment everything can happen because I start to work on the “dress” I want to give to the first idea and then there are also my mates… I always send some ideas to them and it’s cool when they bring something to a totally different level. It’s different when we talk about lyrics… when I write a lyric it’s like something that dig deep inside of me. Music, lyrics I always talk about myself and my world, it’s something I want to share, but I don’t want to give every single detail so everyone could feel these words and notes as something personal. I love them all and I change my preferences sometimes… so it’s happen I love especially Smile and I’m really proud of Life and so on… There are two songs very important to me… the 1st one is Desert Flower. I could listen or play it 100times a day and I always find something different. It’s strange because it’s simple, but to me it’s really special. The other one is Smile because I love it and it represent what is difficult for me. It’s easy to write something complex, but it’s really feel free to write something easy catchy and make it special… the song is a great teamwork and I love it! You've covered Zombie from The Cranberries. Why did you choose especially this song? This is a weird song. We were deciding the set list for our 1st gig after the EP and we decided to play also a cover, so everyone of us try to arrange something distant from the rock metal world. After few days I came up with this arrangement of Zombie and I said I want to play as the last song of the set list due to its long and epic solo in the end… the guys like so much the idea that we decide to record it as the last song of our 1st full length *eheh*. It’s a dynamic picture of life… a lot of images that describing our lives: good and bad moments, something is out of focus but it’s good because you can fill the blank with your own imagination. It’s all that we are with our problems, our fights, and our determination to show who we are and what we can say through music! How much of the plannings/prearrangements for a second album did you get done up to now? For me it’s easy: Dream Theater *ahah*… but there are a lot of artists I love and respect from Alter Bridge to Christina Aguilera. Can you imagine? Absynth Aura before Christina Aguilera or Rihanna... they also play rock when they are live, but we can play rock also on our CD. It will be cool. I love to think about how can be to break up some boundaries between different genres… There is also a marketing side when you are support band, it must be something useful for your band not just a sort of lucid dream. In which age you´ve started play bass guitar? I was 16, but I started to play classic guitar when I was 9 and then electric when I was 12 and I quit when I was 15. I bring the bass because some friends ask me a favor for a gig... it was the 04. Feb. 1996 and this is the day *ahah* it all become when I had the 1st gig as a bass player. I understand I have to try and I buy a bass, an amp and start to take private lesson to improve myself. Which bands and bass players would you name as your greatest influences? Social networks like e.g. Facebook and Twitter are indispensable for bands nowadays. Do you see it as a good chance and as an inspiration for your music to get contact with your fans there and to read their opinions? So many plans, ideas... let’s start from Absynth Aura… first of all we want to record the 2nd CD, this is our priority and then... touring!!! What about me… I have already finish a new instructional for the 1st time also in English and I have finish a CD of Power Fusion with two wonderful musicians and friends. Right now I’m writing from my new studio and starting to produce a Hard Rock band and try to find a good way to give lessons also via Skype because I have a bunch of requests, but I want give best possible quality to this people who need internet to reach me. First of all thanks to you for the wonderful questions. You can follow us on Facebook or on our official website, band or personal, to be always update about: videos, pix, news stuffs, clinics and personal projects. We are a great family and everyone of us give his best for the band but is also a fan of his band’s mates career. We’re living in a very good musical environment there are a lot of great bands, musicians and people around us and we’re proud of what we are doing, also thanks to people like you who support new bands so… thank you twice!